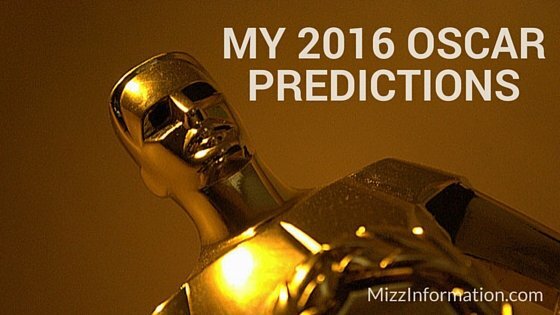 It’s the best day of the year if you’re a movie fanatic– the Oscars! It’s gorgeous out and I should be outside instead of inside writing this, so I won’t beat around the bush–here are my predictions for tonight’s winners. I will say these few things first, though: I didn’t see all the nominated movies–I never do, even though I see a billion movies. Here is the list of movies I did see in 2015. For these predictions, I’m picking the ones I think will actually win, not necessarily the ones I think should win. If I were picking, I’d probably pick Matt Damon as leading actor but I’m pretty sure that’s not going to happen. I can’t tell if my best supporting actor pick–Christian Bale–is just my own bias or he’s really the one who should win–I loved him so much that I can’t be objective–sorry. And I’m pretty sure I’m the only one who thought Room was only meh, but I’m still thinking that Brie Larson will win–I can’t sure if it’s because I think she deserves it for the role or if I just think she’ll be popular choice. Also, I’m sad that I think the Martian is pretty much going to lose out because it was a great movie–but with Spotlight and The Revenant, I think it will get–no pun intended–eclipsed. And finally, for those categories I didn’t see any or for which I don’t really care/know, I just guessed…or just skipped. So there you have it–enjoy the show tonight!